The more time I spend on the water, the more I realize that rivers, like people, have personalities and a fisherman sympathetic to his environment establishes relationships with waterways in much the same way as he does with the folks around him. This past week, I had the great pleasure of spending time on three rivers - the Roanoke, the Haw, and the Smith - a renewed acquaintance, an old friend, and a new companion. As it is with people, first impressions are strong, but not necessarily permanent. My first visit to the Roanoke, in the spring of last year, left me with mixed impressions, at best. The river is, how can I say this nicely, not the most picturesque strip of water you have ever seen and my first visit there left me with a broken fly rod, an emptied fly box, and very few fish. That day I avoided a skunking, though when the wind blew from the direction of the water treatment plant, you wouldn't have known it. I was in no hurry to return. In time, the rod was fixed, the box refilled, the harsh memory dulled, and the stripers returned again, as they do each spring for their annual spawn, so Monday I renewed my acquaintance with the river. This time, I had the Striper Master, the Roanoke's friend, as my fishing partner and I was greeted more warmly. The phrase "I'm with Pipes" worked. Though still an outwardly featureless stretch of water, Pipes knows it's quirks, it's subtle variations in depth and flow, and placed us in the regular holding spots for schooling stripers. A leaden sky, depressing for the layman but perfect for the fisherman, along with a pleasant temperature and active fish made for a fine outing. After a winter of waving wispy small stream trout rods, I dug deep into the closet for my beastly 8wt, loaded with a 350 grain sinking line and 2/0 tuti-fruti (pink and chartreuse) clousers, and spent an afternoon of shoulder wrenching, water hauling, chuck and duck fishing. It wasn't pretty, but it was what the river and fish required and allowed Pipes and me to boat at least a hundred beautiful striped bass. Heavy fish in heavy current will work a fisherman hard and you can be sure that I slept well that evening. Perhaps that morning's 3:00am wakeup had a bit to do with that as well. So my second visit to the Roanoke softened the first, and I look forward to returning, next year, when the stripers are back again. The river, for now, has restored my faith, and I think I can begin to call it a friend. What can I say about the Haw that I haven't said many, many times already? It's my regular haunt, my old friend. Wednesday morning I took a perfect North Carolina spring day and spent it on the river. Brilliant Carolina blue skies thrill the soul yet suppress the fishing, but it didn't matter. Simply being on the water was enough. I wet waded my half-mile of the river - rocky bottomed, tough walking, but familiar - visiting the usual places, wandering the braids without thought or care, in the same easy manner that two fast friends can share a campfire without conversation, comfortable in the silence that their friendship enables. I didn't have to ponder where the fish were - my 6wt bass rod knew the way. The fish would bite in pool A or along bank B, or they wouldn't at all. I knew where to wade and where to rest. The morning passed, like many mornings before it, comfortable in its familiarity. There's little to tell - a quartet of largemouth bass and a surprise catfish - and that's just fine. It was time well spent with a good friend. To finish the week, Loki and I headed to southern Virginia for my first handshake with the Smith River. While my first impression of the Roanoke had been awkward, my first on the Smith was easy and comfortable. A tailwater of Philpott Lake, the river is wide and shallow - easy wading on comfortable, round river rock and perfect water for my favorite Winston 6wt. 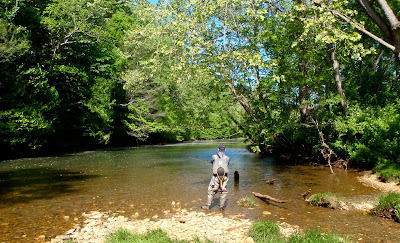 The fishing, however, is as tough as the wading is easy, and was made tougher by another beautiful, sunny day on crystal clear water, allowing the wild brown and rainbow trout to see us from far, far away. The Smith has a reputation for large, trophy brown trout, though the population has declined in recent years. It was hard to imagine it in the shallow waters we waded, but as I brought towards net my first fish of the day, a stocky ten-inch rainbow, a dark torpedo, easily 25 inches or more, appeared from a shallow seam to chase the hooked bow as it slashed about. The size of the follower was startling, and established an edge of anticipation to each cast, each drift, for the remainder the day. Sadly, the rainbow was only one of a couple of fish that we caught during the day, despite trying a little bit of everything - nymphs, streamers, dries. 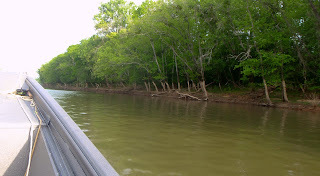 A technical river on a bright day is a challenge, but the potential was there and the waterway is a joy to traverse. My first impression was a fine one and I will undoubtedly return to further develop my relationship with the Smith as the spring progresses. And relationships with rivers, like relationships with friends, take time and patience. Rivers, like people, have their good days and their bad, can be stingy with their possessions on one day, and generous another. But often, rivers respond to those with whom they have cultivated a relationship, to those who have learned their quirks, to those who care. Secrets come with time. And to the fisherman who loves the place as much as he loves the chase, it's worth the time and effort - for a friend. Nice Report Mike, I have to totally agree about the Roanoke. I had a great day with pipes, but as a river itself. It's nothing to brag about scenic wise. The fishing is unique too. I don't know to many places where you always use sinking line and chuck big clousers all day. It's definitely a workout. You should be ashamed of yourself! Three rivers in three days? My political leanings make it hard for me to be "Green" but I must say that I'm oficially green with envy! Great report Mike.